We had another cool and mostly cloudy day. It was supposed to be sunny and upper 70's. But it was only about 65 and overcast when we set out for a run at 11:45. We decided to actually, willingly do speed work. I haven't done any real speed work/drills since probably January. We've done a few tempo runs, but those were mostly unplanned. We warmed up for a mile while heading to our destination. Since we weren't on a track with marked distance (ran on a park lawn), we measured distance by our strides. Jason had this workout from years ago - it's similar to striders or gentle pickups. You start off easy then gradually increase speed to about 90% of max effort. Most suggest ranges of like 80 meters (just one example). Then a brief rest before repeating. We counted our strides for right foot strike. Jason was counting 20 (so 40 steps total) and I chose 25 because 20 didn't seem to get my little legs very far ;-) We repeated 12 times total then ran another mile back home for 3 miles total. I will say that doing drills like this, if you really pay attention, can tell you a little bit about your form, what you might need to improve on. I am feeling the workout mostly in my quads, this tells me I am not fully or properly engaging my hamstrings and glutes. Huge weakness still and this is probably what is preventing my piriformis from recovering. No strength and mis-use. Of course, this is my non-professional opinion. A very frustrated, non-professional, too-much-googling opinion. But, the run? Short, sweet, sweaty. Remember how I've been on a grilled kale kick? Well, it's back again tonight. I debated on several different things I wanted to try, including grilled kale & tofu sandwiches or wraps. 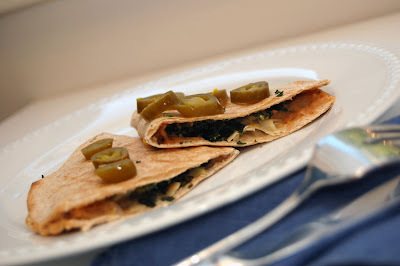 What I ended up going with was Grilled Kale & White Bean Quesadillas. To grill the kale, I simply clean it, de-stem, and give it a good chop. I lightly dress it with olive oil, salt, and ground pepper. I use a veggie grill basket and just grill until tender. You'll get some nice crisp edges too - similar to kale chips. Also added in a white onion to grill with the kale. For the filling of the quesadilla, I blended up: white beans, sundried tomatoes, roasted red bell peppers, drizzle of olive oil, a few tablespoons of soy yogurt and seasoned with parsley, oregano, thyme, salt, and pepper, a splash of lemon juice and a splash of red wine vinegar to brighten the flavors. I always lightly grill or brown one side of my tortilla before flipping over and filling it. I think it prevents it from getting mushy with both sides being crisp. 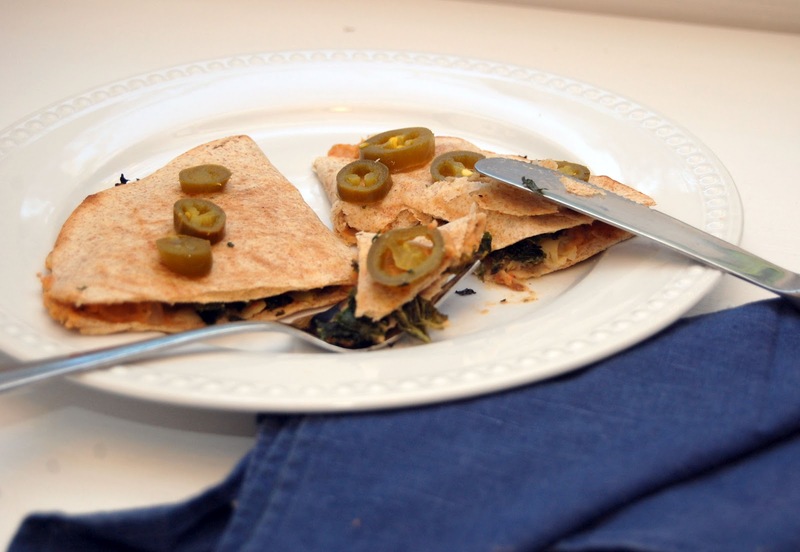 I spread the bean mixture evenly and add the kale to half the tortilla then fold the other side over. I find it a lot easier to cook them this way rather than stacking one tortilla on top of the other and attempting to flip them. Please please please hang up the phone when driving unless it's just an absolute, must-take, urgent call. I almost got into a serious wreck coming home because someone was talking their cell and blew through a red light coming off an interstate off ramp (meaning they weren't driving slowly). I am so very thankful that my reactions were quick and correct or I would have been T-boned. No phone call or text message is that important.